BERLIN, 16-10-2018. On the last October weekend, thousands of activists will block coal infrastructure around the Hambach mine in a mass action of civil disobedience. 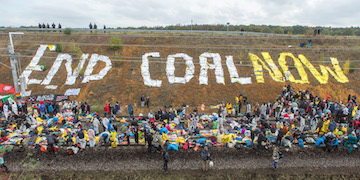 By doing this, Ende Gelände stands up for an immediate coal-phase-out and for global climate justice. Three open-cast lignite mines and three massive power-plants make the Rhineland coalfield near Cologne one of the biggest sources of CO2 in Europe, and a focal point of the climate movement.